The digital era has ushered in a time of major technological disruption for libraries. How will the climate crisis further re-imagine the library world? And how can library folks respond to the climate-based changes already underway on our planet? Check out my Storify to learn more! And YES I am available for keynote and guest speaker opportunities! Help me spread the word about where libraries are headed and how we can be prepared for the #disruptivefuture that awaits us! 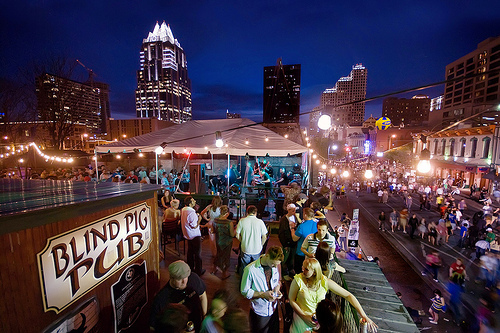 I’m headed to Austin, TX next month to co-present a session with my friend and colleague, Jacqueline Whyte Appleby and the Electronic Resources & Libraries conference. Our session is entitled, “More Licenses, More Problems: How to Talk to Your Users About Why eBooks are Terrible“. Not a controversial title at all, is it?! (That was all Jacqueline’s idea, I swear). The problem, as we see it, is the utter lack of consistency in eBook experience for users – across licensing and access models, platforms, formats… it’s a fractured environment.Which is okay because it’s an emerging and ever-changing landscape. But users don’t know this! Or care. They just know that eBooks are sometimes terrible. And with the introduction of new licensing models, the environment is getting more fractured, and the user experience… well, sometimes more terrible. In the world of academic libraries, the traditional eBook access model was fairly simple – libraries purchased single-user or multiple-user access to an eBook (allowing for either one person to access the book at a time, or multiple people to access the book at a time), and a direct link sent users to the contents of the book. There were some exceptions and variables on this, but on the whole, users expect to find a direct link in the library catalogue, and be ushered to a landing page where they can read the contents of the book. 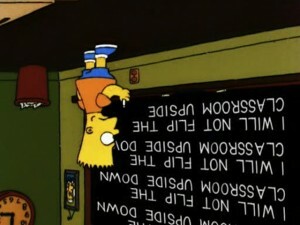 In a flipped classroom, professors don’t lecture in class. Students watch recordings of lectures online as homework. They learn the material on their own time, freeing up class time for collaborative activities, such as group projects and classroom discussions. So I missed the third week of Startup Library because of a stupid cold. While all my noble comrades were flocking to Guelph to start a library revolution, I was on my couch watching endless episodes of Community and feeling sorry for myself. I’m patching this blog post together based largely on materials provided by the workshop organizers which, like the rest of Startup Library, are extremely well put together and thought provoking. I’m trying to work through this stuff mostly for my own benefit, since I need to get caught up for the last session – Week 4, which is tomorrow! This week I attended an SLA Toronto article night, hosted by John Shewfelt – “Google Glass and Libraries: The Beginning of the End or the End of Irrelevance?” – a topic on the bleeding edge right now, and one that’s sure to cause ripples as the technology becomes increasing ubiquitous. Diane Von Furstenberg’s Spring 2013 runway collection featured all the models wearing Google Glass. 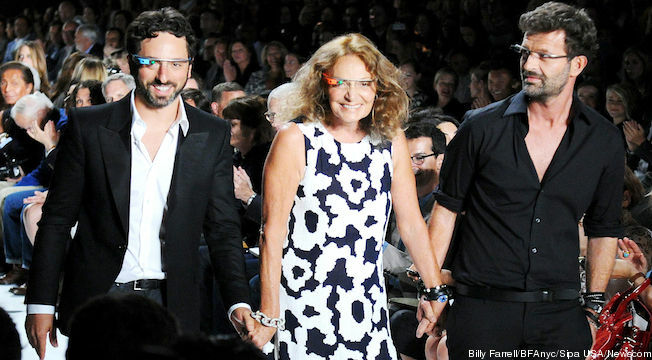 Here is DVF with Google co-founder Sergey Brin. But much like everything that’s ever happened at New York fashion week: Just because some skinny models wear it, doesn’t mean regular people will. I mentioned earlier this week the lovely little tweet-exchange that my Twitter pal Minister of Heritage James Moore had with some librarian peeps. There have been some incredible efforts on the part of librarians and archivists this week to battle the ridiculous Code of Conduct being imposed on staff at Library and Archives Canada. In particular, a few freedom fighters came to the fore and managed to push the issue into the national spotlight. Myron Groover, a.k.a., Bibliocracy, a.k.a., my Twitter homeboy also happens to be the Chair of BCLA’s Information Policy committee. He gave a stellar interview to CBC Radio One’s As It Happens, which is a nationally-broadcast current affairs show on the issue of the Code of Conduct and why it makes no sense. You can hear the interview here. It’s sort of a big deal. Kim Silk, a fellow librarian in Toronto staged a twitter and e-mail campaign to various CBC radio shows and got a response from Jian Gomeshi, host of another nationally-broadcast show on CBC radio called Q, which is focused on the arts and pop culture. No biggie (!!! He’s kinda famous!!!). Jian focused exclusively on the “chilling” Code of Conduct in his opening essay on Friday. Listen to it here. I also came across this interview via Radio Canada International with James Turk, executive director of the Canadian Association of University Teachers (an organisation that includes academic librarians and has been very outspoken against cuts to Library and Archives Canada in the past). It’s a nice long-form interview and he articulates the issues really nicely. As such, I deem James Turk an Honourary Librarchivist, with all rights, privileges and obligations pertaining thereto. Some seriously awesome developments . And how has the government handled this simmering issue? By shutting down the debate, of course. Oh, and here’s a really in-depth and well articulated letter from Daniel Caron regarding the Code of Conduct. He does a great job of acknowledging and addressing all the various concerns of the information community and giving a detailed response to each. Tweeting with the Heritage Minister: Just another Tuesday night in my world. I mentioned last week that I plan to write a letter to the Minister of Heritage, James Moore, outlining my concerns over the systematic cuts to Canada’s institutions of research, heritage, knowledge, and information. However: He sorta beat me to the punch. This evening, several fellow librarians and I received 5 separate tweets from the Minister pertaining to some comments I sent his way concerning the new Code of Conduct for staff at Libraries and Archives Canada.